Santa Cecilia Granite White Cabinet Backsplash Ideas will make you happy during the kitchen remodeling process. In this article, I would like to give the name and the characteristics of the backsplash, the color and glaze of the white cabinets as much as I can. Backsplash color selection is very easy for this lovely lady. Santa Cecilia Granite is known for her beautiful and friendly feature. These days the white tone cabinets are being very fashionable and Santa Cecilia is a good choice for soft tone lovers in a kitchen. This is a very smart backsplash color selection tip. The white tone kitchen cabinets usually match with Santa Cecilia Light Granite. The flow of Santa Cecilia brings some fresh influence in your kitchen. As I mentioned in my Friendly Feature: Santa Cecilia Granite, the backsplash colors are like white, cream, bone, or light tone earth colors. The material for the backsplash can be ceramic, glass, travertine, copper or Santa Cecilia Granite itself. The type of the backsplash tile would be subway, mini subway, matchstick, 4×4 Square and mosaic. The borders are a very good embellishment in any kind of selection of backsplash. Santa Cecilia Granite White Cabinet Backsplash Ideas Pictures for your review. Picture Credit: Homesteadktichens via Houzz. 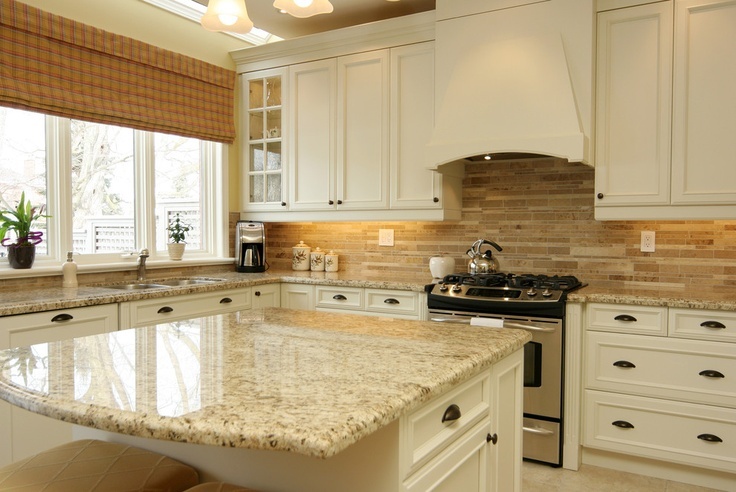 , Pearl glazed white maple cabinets , santa cecilia granite countertop with beige glass tile. Chandeliers and valance are bonus in this magnificent kitchen design. Very inspirational picture. Picture Credit: Snappy Kitchens. White cabinet with Santa Cecilia Granite and 4×4 Crema Imperial Tumbled Travertine with nice border: Glazzio opulence series golden leaf (OP20). The selection of sink brings fine taste, Blanco, divided enamel sink. Very satisfied design. Picture Credit: Hardrock Construction. Crema Marfil mosaic polished marble, mini subway tile as 1″ to 2″ is very pretty with white cabinets ,Santa Cecila Granite and Black enamel sink. Picture Credit:MCdesignsinc. French Style Vintage White cabinets, Santa Cecilia granite and lovely combo of white and colorful mosaic backsplash. White backsplash uses as diagonal and mosaic colors are catchy. The hood and the tray cabinets next to hood are amazing idea. Santa Cecilia Granite and Biscotti with Cocoa Glazed Cabinets and Durango Limestone Subway Tiles. Picture Credit:Freedom Design LLC. Santa Cecilia Granite with Biscotti with Cocoa glaze cabinets and Durango limestone subway tile. I also like the stone hood and chandeliers . Lovely design. Picture Credit: Plainfancyliving blogspot. Such a good example of Santa Cecilia Granite White Cabinet Backsplash Ideas. I like the shine of the white subway ceramic tiles. Please share your backsplash ideas and post pictures of your kitchen. We can create together a very useful site for curious homeowners. Please make Santa Cecilia Granite White Cabinet Backsplash Ideas better. Thank you for your collaboration.